Since the arrival of Digital Transformation, Digital Media of all kinds have become an increasingly significant part of our day-to-day experience. With each passing day, the consumption and interaction with photos, audio files, video clips, animation, games, interactive ads, streaming of movies and even experimental marketing, are only gaining more traction, especially after the emergence of virtual reality and augmented reality that are supporting more innovation in this area. These advancements along withthe increased network bandwidth,decreased storage costs, high performance processors, affordable Cloud services, and the requisite digital media infrastructure, are together not only driving the digital media boom forward, but are also presenting organizations and consumers with the increased need to manage and organize their experiences and the consumption of digital medial files. Corroborating this fact are research reports that forecast the Global Media Management market to grow at a CAGR of 5.9 percent and reach revenue of USD 10.5 billion worldwide by 2021. However, even with this progress, effectively managing digital assets over the asset’s entire lifecycle is no easy task for most enterprises, particularly when it comes to Video Asset Management where broadcasters face a wide range of challenges in the preparation and delivery of digital video in an efficient and cost-effective manner. With video content now needing to be delivered across a growing number of platforms and screens, processing of video assets in multiple formats is not only challenging but also calls for more advanced technology, workflows and tools, all of which only increases operational complexity. Perfectly understanding these challenges and demands, Singapore based PurpleStream Convergence Pvt. Ltd steps forward to address them with a comprehensive suite of Video Processing and Asset Management services, to simplify and facilitate seamless video content delivery for customers. PurpleStream’s expansive portfolio of offerings includes PurpleStream Cloud, PurpleStream Beam – A plug and play video delivery service, PurpleStream Live – live streaming of events in broadcast quality and Technology-as-as-Service (TaaS). The company has also established an extensive back-end support team in Chennai to support its various video processing and media asset management operations. When it comes to clients, PurpleStream boasts of a widespread customer base, which entails video and digital media companies including CDNs, TV/IPTV/ Cable broadcasters, content creators and rights owners, wireless carriers, and telecom enterprises. Additionally, PurpleStream also caters to the needs of Consumer Electronics OEMs of cellular phones, HDTVs, STB's, laptops, webcams, and PCs, among others. delivery services, the PurpleStream Cloud is a proprietary system, which was formed as a result of the deep experience and expertise, carried by the PurpleStream team. As a Smart, Cloud-based Broadband Broadcast Platform, this solution encompasses intuitive systems which aggregate content from service providers and then transcode them into viewing formats that can be optimized for any device under the sun. The PurpleStreamCloud thus enables content dissemination to any Internet supported device. This Cloud platform also takes advantage of the global network of downlink facilities and transcoding farms established by PurpleStream to ingest satellite TV content and provide cost effective turnaround solutions to global OTT operators and broadcasters. 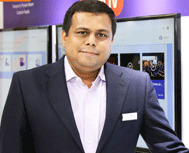 "We have always focused on building strategic alliances where the client’s content is paired with our streaming technology and convergence expertise to create a unique business solution for customer driven brand advocacy as a result"
The PurpleStream Cloud thus offers a CloudTV solution to Broadcasters, Content Owners and OTT players by enabling their content across all connected devices and empowering patrons to view their content across the world. PurpleCloud also delivers streams on a multi-CDN platform thereby ensuring redundancy and a high quality of service. “With the PurpleStream Cloud, we combine the unified power of several POPs of multiple service providers to create a syndicated distribution network that brings a unique value proposition to our clients in terms of video delivery, explains Karthik. “We have also taken content closer to the end user, thus reducing the latency and in turn reducing the buffering of videos,” he adds. In order to ensure customers with seamless and efficient delivery of video streaming for any device and scale, PurpleStream brings its PurpleStream Beam – a plug and play video delivery service for broadcaster content and live events. This solution allows not only Broadcasters but also content providers and event organizers to take advantage of its simple installation and top performance to deliver top quality live streaming at an affordable price. Moreover, the PurpleStream Beam also takes standard definition (SD) and high definition (HD) content and delivers them to the end-users. Be it for mobile devices, tablets or TV, all video content is delivered with optimized quality with videos transcoded on-the-fly for industry leading performance. To transcode videos in the quickest possible manner, the PurpleBeam acts as a H.264 encoder with multiple video interfaces and also supports 4G SIM/Wi-Fi and Ethernet Interfaces. The device takes the video input at source and based on the upload speed available, pushes the highest bit rate video to PurpleCloud, where the video is then transcoded on the fly for various device formats and ingested into the CDN. This video is then seamlessly delivered to the end users at the highest bit rate based on their Internet bandwidth and connectivity. In addition to PurpleBeam, PurpleStream also equips its customers with an Integrated Video Delivery Platform - PurpleStream Live, which is combined with its unique Single Source Multi Device [SSMD] technology to enable live webcast of events. This solutionenables the webcast of events in resolutions that are comparable to the highest and broadcast quality that is unparalleled. A comprehensive toolkit that comes with the service also helps clients measure the broadcast's audience and viewership along with detailed statistical analysis. Some of the major events supported by this service includes Conferences, Internal Corporate communication meets, Shareholder messages and meetings, Product launches, Keynote speeches, Training modules, Special events, CEO Briefings and Analysts Meets. Having assisted several organisations in their Video Processing and Asset Management projects over the last decade, PurpleStream has emerged as a distinguished solutions provider in this domain with extensive industry expertise. Be itfor Broadcasters, Content Owners, OTT Players or Consumer Electronics OEMs, the company today stands as one of the most credible business partners for Digital Media Management services. As a testament to this, PurpleStream today boasts of several success stories with over 150+ Broadcasters and TV Channels and 15+ Global OTT Service Providers that employ the company’s services. PurpleStream has also served the Government and Enterprises vertical, where one such project was the Live Web Streaming of the TN Elections with 27000+ live unique source streams ingested from polling booths spread across PurpleStream’s platform. Furthermore, several prestigious Faith and Worship organizations including Angel TV; have also created their own private OTT platform using PurpleStream to reach their followers across the globe. Attributing all of this success to the company’s team, CEO Karthik believes that it is PurpleStream’s technical proficiency, exceptional commitment to excellence and delivery track record that have helped the company differentiate itself in the market today. Moving forward, PurpleStream is en route to building a first of its kind Digital Technology Marketplace solution - Content eXchange Platform (CXP) that will leverage Blockchain, AI and ML tools to connect Content owners and Service Providers across different geographical boundaries. PurpleStream is in the process of acquiring few companies in the Video Processing Technology ecosystem and expanding its footprint globally.